Ultimate Battle társasjáték - Magyarország társasjáték keresője! A társasjáték érték! Az Ultimate Battle egy nagyszerű társasjáték, 2 játékos részére, az átlagos játékidő rövid, csak 15 perc. A játékmenet erősen épít a történetmesélés és a ceruza-papír mechanizmusokra. Ultimate Battle challenges players to use creativity and think on their feet. The arena: a sheet of paper set between the players. The fuel: Ultimate Battle cards and a good, thick marker! Do you have what it takes to out-think, out-maneuver, and out-sketch your opponents? Combine cards, launch devastating attacks, and defend against a barrage of creativity! In Ultimate Battle, the goal is to utterly destroy your opponent. In this creativity-fueled game it's one-hit destruction, so players must plan attacks and defenses carefully. The gameplay centers around two to four players each drawing from a deck of Ultimate Battle Cards. These fully illustrated cards contain everything from powerful weapons and creatures (like sharks and poison) to more mundane objects (like a brick). Using their imaginations, players must illustrate attacks against their opponents on a large sheet of paper rolled out between both players. The attacking player uses any combination of cards in their hand to launch their attack. The defending player must then use cards from their hand to defend. If players disagree on whether an attack or defense is valid a Disagreement Card is drawn, which quickly resolves any qualms. This gets the group back to playing as quickly as possible. If a player can't defend an attack, or loses a disagreement when trying to defend, he or she is destroyed! 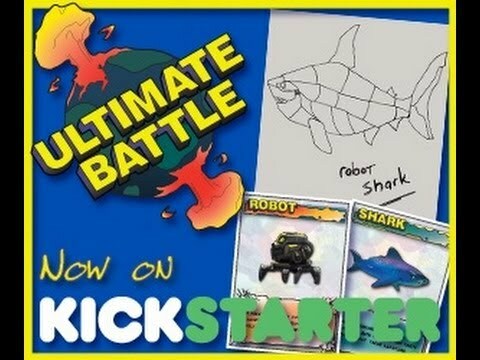 Whether a world-class artist or a stick-figure impresario, everyone can draw out wild attacks in Ultimate Battle. Think quick, sketch even quicker, and may the best battler win!